What a week it’s been. From new arrivals and official announcements, to big revelations and spicy rumors, so much has happened across the tech world that it’s been tough to keep up! But worry not, for 7 Days is once again here to guide you through the biggest stories of the week – and this time, we begin in a galaxy far, far away. It’s slightly bizarre to think of a movie franchise as big as Star Wars not being available from digital stores – but until this week, the only way to watch the movies (not counting illegal downloads) was to buy them on physical media such as DVD. But on Friday, the Star Wars saga finally made its way to leading digital stores, including iTunes, Google Play and Xbox Video, among others, priced from $89.99 for the full set. On Wednesday, Intel’s CEO showed off the company’s RealSense 3D camera in a smartphone for the first time. The depth-sensing camera technology has previously been seen in desktops, notebooks and tablets, and with smartphones also getting in on the action, it opens up the possibility of a full range of RealSense-equipped devices that can work with Windows Hello, Microsoft’s new biometric authentication system, which the firm hopes will eventually replace passwords. It’s been a huge week on the Windows 10 front, and in fact, the action began last weekend, just hours after the publication of the last 7 Days round-up, when build 10051 of the desktop OS leaked on to the web. The new build gave us our first clear look at the completely redesigned Mail and Calendar apps that now feature Outlook branding. If you’ve installed Windows 10, you’ll already have access to the beta version of the new-look Windows Store. In a shift from its exclusive focus on apps, Microsoft is expanding the Store to turn it into a centralized point for all of its digital content, rather than offering multiple standalone stores for apps and entertainment. On Thursday, Microsoft introduced movies and TV shows to the beta Store, and it has said that music will also be added in a future update. Keen followers of Microsoft codenames may be interested to know that ‘Project Arcadia’ popped up again this week. Little is known about Arcadia, although it’s believed to be an Azure-based platform to deliver streaming games and apps to devices. A recent Microsoft job posting referred to Arcadia as a product that has “NEVER [been] done before”, and one that will “delight end users on Windows Mobile”. Whatever Microsoft has in store for Arcadia, it all sounds rather exciting – but it’s still some way off. But in the meantime, the latest version of the company’s mobile OS has already made its official debut. But with the launch of Windows 10 around the corner, there doesn’t seem to be much time to roll out Windows Phone 8.1 Update 2 to existing devices – which is why Neowin asked Microsoft on Thursday what its plans are in that respect. Chris Hollis, head of global communications for Microsoft Devices, said that Update 2 will come to select devices, including the Lumia 735 and Lumia 830, on some carriers, and in some markets – but he was unable to provide further specifics. A key focus of Update 2, he said, is to comply with new US legislation on anti-theft protections for mobile devices, so handsets in America are therefore most likely to receive it. But while Update 2 won’t be released for all Windows Phones around the world, the company’s next-gen mobile OS will be much more broadly available. And while we’re still a few months away from its release, Microsoft’s vision for Windows 10 for phones is slowly coming into focus. If you’ve been on the lookout for a low-cost Windows Phone in the UK – perhaps even one on which you can take the Windows 10 preview for a test drive – EE may just have the ideal device for you. The UK’s largest carrier is currently selling the Lumia 435 for just £24.99 on pay-as-you-go, although you will also need to buy a £20 top-up to get it at that price. If you’ve got a bit more to spend on a capable but affordable Windows Phone, two new handsets have just launched in the UK. The 5-inch Lumia 640 is available now from just £99.99 off-contract, and offers some pretty impressive specs for the price. Its bigger brother, the 5.7-inch Lumia 640 XL, will be available in the next few weeks, priced from £219, and gets a couple of spec bumps over its sibling. The two handsets also launched in India this week, priced at Rs.11,999 for the 640, and Rs.15,799 for the XL. Both devices are the first to launch with Windows Phone 8.1 Update 2 onboard, as well as being the first to come with a free one-year Office 365 Personal subscription for your PC. Over in the US, Verizon had been expected to exclusively offer the Lumia 735 from last year, but it reportedly pushed back its launch plans to ‘early 2015’. But as we’re now moving into mid-2015, you’d be forgiven for assuming that Verizon had simply given up on the device. However, it seems that the Lumia 735 is still on track to join Verizon’s line-up, with a launch rumored for next month – eight months after the handset was first announced. You’ve really got to wonder why the carrier even bothers with Windows Phone when it clearly has so little regard for the platform, as many Verizon customers know for themselves. The 735 still isn’t officially available anywhere in the US, but one device that’s had a much better run there is the Lumia 1520. Originally announced in late 2013, the device was finally withdrawn from sale in the US this week, leaving the HTC One M8 for Windows as the only flagship-class Windows Phone available in America. Die-hard Windows Phone fans – along with anyone who’s trying to sell you a phone – will tell you that the platform’s app problem is a thing of the past. It’s not. Big brands like Bank of America have been ditching their Windows Phone apps, while many other leading brands simply have no interest in bringing their apps to the platform while its market share remains so small. Last year, games developer Kabam announced plans to bring many of its popular games to Windows and Windows Phone, but this week – after having launched just one game on Microsoft’s operating systems – the company said that it had abandoned those plans, to focus solely on iOS and Android development. So much for the end of the app-gap. But while some companies take their business away from Microsoft’s platforms, Microsoft itself is continuing to make its software more widely available on rival operating systems. The latest example is Office Remote – an app used for controlling PowerPoint presentations – which launched on Android this week. And in a further example of Microsoft’s growing cross-platform software strategy, the company announced on Thursday that it is expanding Dropbox integration for non-business users in Office Online. For those who like to use Microsoft’s products and services both to stay productive and have fun, the company reintroduced its Work & Play bundle this week – although sadly, it’s still only available in the US. The bundle includes one-year subscriptions to Office 365 Home, Skype Wi-Fi + Skype Unlimited World, Xbox Live Gold and Xbox Music Pass for $149 – saving you $250 on the total cost of buying these subs individually. And there was good news for Xbox One owners in the US this week, as Microsoft introduced support for over-the-air TV tuners in America and Canada on Wednesday. With a supported tuner, you’ll be able to watch OTA broadcasts from stations such as ABC, CBS, FOX and NBC on your console. Xbox One owners around the world got some love this week with the rollout of the April Update for the console, although if you were hoping that it would bring some big new features, you’ll be disappointed. Microsoft’s impressive Skype Translator tool – which can translate spoken words in real-time – expanded its capabilities this week, with the addition of voice translation support for Italian and Mandarin. Neowin’s Senior News Editor for North America, Brad Sams, immediately put it to the test, by calling Shaosen Chen from WPDang.com for a cross-lingual chat. It’s fair to say that Skype Translator is far from perfect – but the potential for this technology remains hugely exciting. Seven months after it was first unveiled, Apple finally opened pre-orders on Friday for its long-awaited Watch. Within minutes of pre-orders opening, delivery times had already slipped to June on many models. Bizarrely, despite this, Apple promotional material – including its own website – still claims that the Watch will be available from April 24. This means that either the company is holding back stock to be able to sell devices to customers from that date – in which case, there would be little point in placing a pre-order for delivery in June; or it’s simply being disingenuous, referring to that date simply because that's when a handful of customers will take delivery. Either way, don’t bother going to an Apple Store to try to buy one – you’ll be able to get a demo (as long as you make an appointment first) but otherwise, Apple will just “make your day” by telling you to go home and order online. That’s some magical customer service right there. Still, while Apple may not have much time for you, you’re always welcome over on Neowin. Whatever you get up to, have a great weekend! 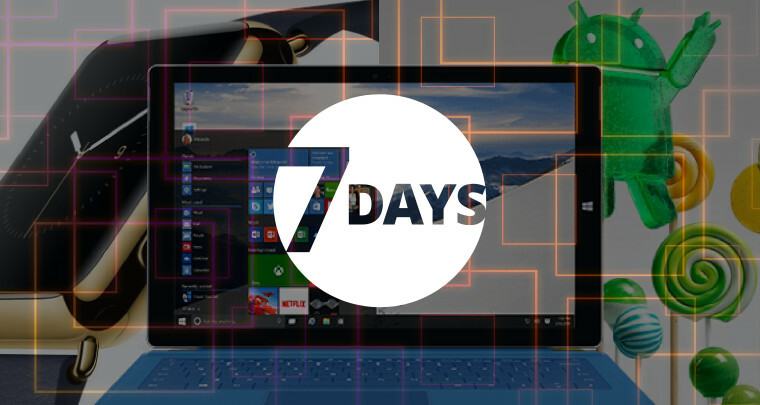 Read the full '7 Days' roundup here.